You’ve decided that online learning is the best way to train and certify your staff, but now it’s time to figure out where your staff is going to take these courses! Setting up a proper online learning lab will help ensure your employees have the proper means to succeed. Read on for tips on how to set up an efficient and effective online learning computer lab. You’ll want to make sure your computer stations are set up in such a way that will make it easy for people to move about the room without distracting others too much. Jumbles of wires can get confusing fast. Color code each set of wires with a colored sticker; that way, you’ll be able to easily identify what computer you’re working with. Creating a crisp, clean workspace is important for learning, as well as safety! Utilize cord snakes, or any other tool that helps to keep cords tidy and out of sight. It’s not just about computers. Even if the majority of the work you’ll be doing is on a computer, consider adding other elements like a whiteboard, tablets, computer-less areas, etc to allow the room to be used for multiple types of learning. 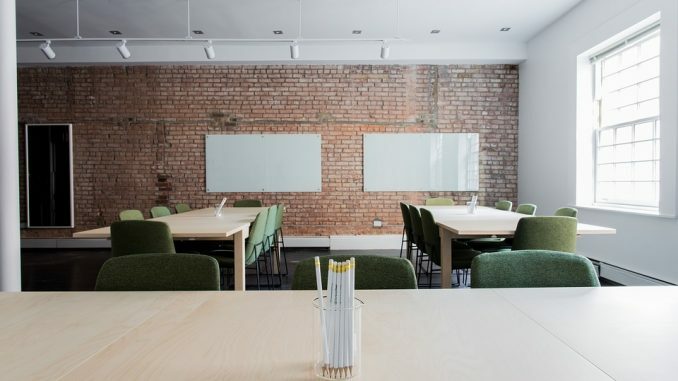 Depending on how you plan to use the space, this may or may not apply to your company; however, many companies find it to be useful to have a “teacher” station near the front of the room for any presentations or classes that take place. Don’t forget to add some plants in the room! While this may sound arbitrary to some, plants not only look nice, but they clean the air too! Having some greens in your lab will keep it feeling fresh and airy, two things that aid with concentration. Make it right for you. Every company will require something slightly different from their learning lab. Make sure you think about what you’ll be using this lab for before planning out the layout and design to make sure it meets your needs. By following the tips above you’re sure to have a well-functioning learning lab that will make online learning and tests a breeze.